Similar to creating a mission statement, defining your values is one of the crucial first steps when beginning a business venture. Why? Because when you face tough decisions, this is what you lean on as a guide. Those decisions are easier to make when you have given yourself permission to make the difficult call. The difference between a mission statement and core values is an important detail; your mission should forge the reason for the business to exist and vales define what you believe in. When you take the time to set your core values and then define what they mean to the business/organization, you force yourself to evaluate how and why you do business. This means having to look at the suppliers you use, customers you target and product/service you sell. By doing this, you can look at your preferred outcomes and determine if they fall in line with your values. 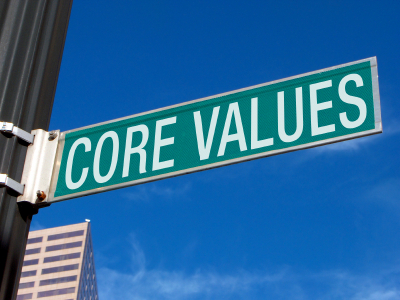 There are several good examples of companies with well-defined core values. In no particular order: Zappos, Southwest and Chevron. I have listed several steps to help you focus in on the values most important to you. I believe the ideal number of values is between 3 and 7; any less and it won’t cover the full spectrum of your business, and with too many the message can get lost. What are your personal values? Personal values almost always reflect the business decisions being made. Why set business values you would have a personal problem living up to? How do you want others to define you? What would you want in a testimonial and what do those words mean to you? Look at your competition. This is NOT to copy, but to see what drives them. Would you have the same values? If so, what would set you apart from them? Get the entire team involved. With a small business/company, everyone can get involved. If you have too many people to fit in a room, find a way to let everyone’s voice be heard. Lock them in and send them out! Once they are set, make an announcement. This doesn’t have to be over the top, but make sure people know what drives you and your business. Once completed, you are off and running. Values are not a required piece of any business, which is why I feel they are so important – values will set you apart. Defining the values of your business will serve as an essential piece of the foundation that success is built upon. To close, here are a few words from Steve Jobs talking about using values when tough decisions need to be made. To get you started, please share what you believe your three personal values are in the comment section below.